At TrustSpot we help businesses collect 2 different types of reviews: Company and Product. In this guide, I will be talking about the differences between each one, when their relevant, and how to get started with them. The 1st type of reviews we offer are called Company Reviews. Collecting company reviews helps tell prospective visitors how others feel about your business as a whole. Company reviews are typically reserved for customers talking about their experience using you, their service experience, or even their experience with customer service. Company Reviews start on our Free Plan, and give businesses - of any size, the opportunity to start gaining valuable feedback from their customers. 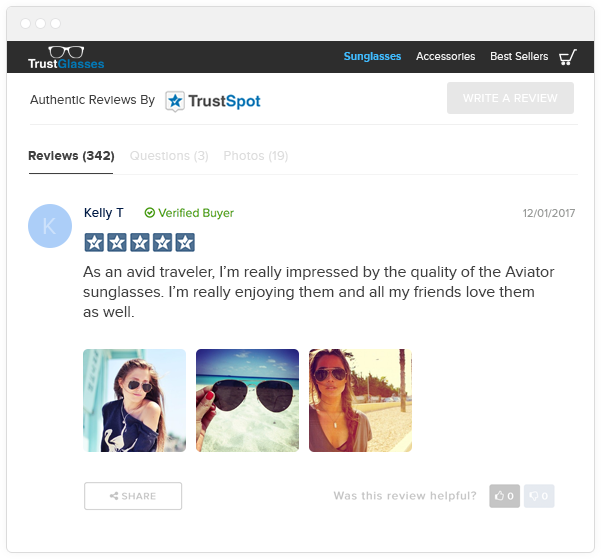 You can collect company reviews with TrustSpot either by integrating directly into your site with one of our plugins, BCC email, Exit Survey, or even manually uploading requests to send out every so often. Once you have company reviews, you can display them on our website. TrustSpot has a library of 12 "Trust Elements", which are review graphics that can be placed on your website. The 2nd type of reviews we offer are called Product Reviews. With Product Reviews, these are meant for customers reviewing a product that was purchased on your eCommerce website. Product Reviews begin on our Growth Plan, and similar to Company Reviews, allow you to start obtaining valuable feedback about your products being sold on your website. In addition, you can also connect to TrustSpot via our Product Reviews API, giving you the freedom and flexibility to send customer information to us at any time. Once you've collected reviews, you can display them on your website.